Fat actually has a thermogenic effect in the body – which means it takes more energy to break it down and use it versus other macronutrients such as carbs. Contrary to what was considered the best way to lose weight at one time – low fat diets can actually cause the exact opposite of what you want to occur. Low fat diets are generally high in carbs, which means they not only provide less fat but also less protein! The result, lower muscle building, metabolic testosterone, less lean mass and more belly fat compared to those who followed diets higher in fat and protein! If you want to shred more fat and build more muscle make sure your diet is providing an adequate amount of healthy fat, at least 30% of your daily calories, from sources such as salmon, avocadoes, whole eggs, seeds and or nuts. Yes, it’s true that you need to create a calorie deficit of at least 500 calories to lose weight, but eating a low calorie diet for an extended period of time can start to back fire quickly. Following a low calorie diet for an extended period of time can cause an increase in catabolic cortisol – the hormone that breaks down muscle, but can also down regulate the hunger hormones including leptin, causing a slowdown in your metabolism, and as result you can hit a plateau. This hormone shift can cause your body to preserve your fat for fear of starvation, instead of burning through it, while opting for muscle for fuel instead! For best results, try using a cyclic diet – where you alternate between high calorie and low calorie days. A cyclic approach can keep your hormones guessing and keeps your body responding! Try cycling between low, moderate and high calorie days, while adjusting your calories to coincide with your workouts. On leg days, eat high calories, on arms and cardio days eat low calories. If your goal is to build muscle and shred fat, you will need to eat more protein— more than you might be used to. Protein is the foundation of building muscle. If you’re following a diet that is not adequate in protein, you will not be able to build muscle, repair or recover properly. This can have you looking skinny fat instead of lean and muscular! 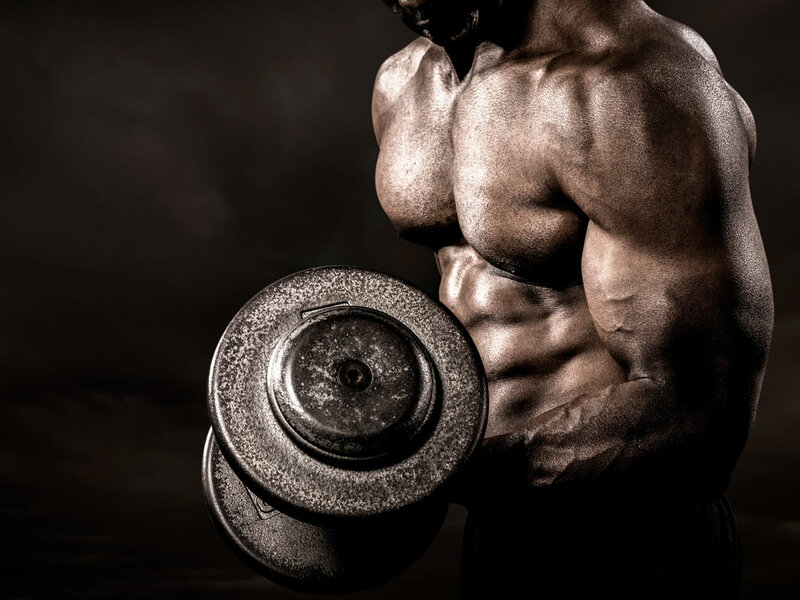 In the muscles, certain amino acids and the level of aminos available ensures that the pathways of protein synthesis or muscle building are turned on. Eating a high protein diet has been shown time and time again to result in not only faster weight loss but more fat loss too! One study showed that athletes, who ate up to 2.6 g of protein per kilogram of weight each day, maintained their lean muscle mass while also losing body fat during a restrictive diet plan. Your diet should provide at least 40% of your calories from protein, while carbs can make up 20% or less, and fat can provide 40% or less depending on your activity level and how much fat you have to lose. Although you do need some carbs in your diet it’s probably not as much as you think. If you’re holding extra fat weight around your middle, that means you have fuel to burn! The more carbs in your diet the less likely the body will tap into other sources of fuel – primarily your body fat. Limiting your carbs forces your body to use up muscle glycogen and tap into stored fat. Ketogenesis – a pathway that derives fuel for the body when carbs are limited can spare lean protein or your muscle and increase fat breakdown. This state called ketosis can only occur though when eating less than 20% of your daily calorie needs from carbs. This diet isn’t for everyone, and is completely dependent on the individual – their activity level, how much weight they need to lose, and their metabolic rate. Although it might be tempting to follow a strict diet all the time, this will not give you the result you’re looking for. Over time, your body will hit a plateau from following an ultra restrictive diet. This will lead to metabolic slow down, and instead of putting on more size or burning off more fat the body will do the reverse – hold on to fat and burn off muscle for fear of starvation. Moderation is the key. Focus on a meal prep that is slow and progressive and doesn’t drop your calories or carbs too low for too long! Once you’ve reached your ultimate goal, don’t immediately drop your diet, slowly, reverse out of your diet by adding back 250 calories at a time. This will keep your metabolism up-regulated, and you’ll also find that you’ll maintain a leaner body composition too! Maybe you have the right diet – your marcos are on point, you eat more protein and have lowered your carb intake but you’re still not seeing results. Be honest with yourself – how consistent are you being. You can’t diet half the time and expect to see your abs – with that type of consistency you’ll only get half the results – if that. Building muscle and burning fat means you can’t just workout hard, you need to diet hard too. Having a hard time being consistent? Try the Fuel Up – Athlete Transformation Series meal plans. These meal plans take not just the guess work out of building a meal plan fit for shredding fat and building muscle, but they also take the prep work out! Simply pick the plan that is right for you, we’ll prep, portion and deliver directly to your door. Each ATS meal plan is designed by leading transformation experts and experienced athletes that know firsthand about what it takes to build muscle and get shredded!